Most readers will be aware of so-called "3D printing" techniques, in which solid objects can be constructed automatically from computer models. Researchers in California intend to scale the process up radically, using "contour crafting" concrete extrusion to erect buildings in a matter of hours. "Instead of plastic, Contour Crafting will use concrete," says Behrokh Khoshnevis of the University of Southern California. Khoshnevis and his colleagues have just announced funding for their efforts from Caterpillar, the construction-equipment globocorp. What do you mean, the picture was back to front? The overarching vision... is to develop the science and engineering needed for rapid automated fabrication of objects of various size up to mega-scale structures such as boats, industrial objects, public art and whole building structures. The USC boffins reckon their robo-gantry gear can do more than just concrete boxes: it can apparently fit the plumbing and electrics as it goes along, do the plastering, and perhaps even fit some structural members. And there's no need for boring old boxy shapes, either. The equipment can happily create domes, vaults or any other shape that can be drawn in CAD software and support its own weight - at no added expense. Normally, anything other than right angles and verticals costs like crazy, so this latter feature is thought to have architects salivating. 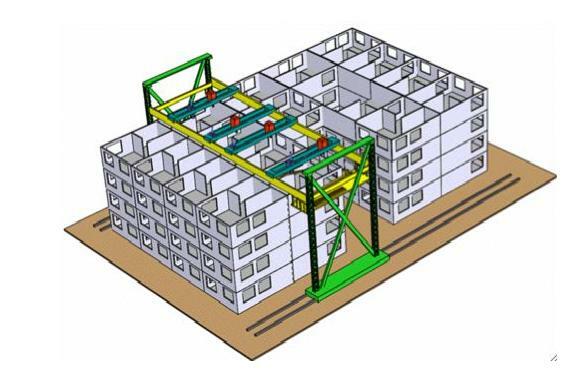 As far as more normal buildings go, the USC constructioneers believe that it will be possible for an automated setup to erect a 2,000-square-foot, two storey house in 24 hours for about one-fifth of what such a project would normally cost. Khoshnevis and his chums are chuffed to announce their new partnership with Caterpillar. They also say that NASA is interested in using their gear for building bases on the Moon or Mars, without astronauts having to loosen their spacesuit trousers and heave hods of bricks about. Other private and government organisations are involved, including the US Army Corps of Engineers and building-materials firm USG.